In the first in-depth research of its kind, sociologist and cult expert Janja Lalich, Ph.D. interviewed 65 individuals who were born in or grew up in 39 different cultic groups spanning more than a dozen countries. What’s especially interesting is that they each left the cult on their own, without outside help or internal support. 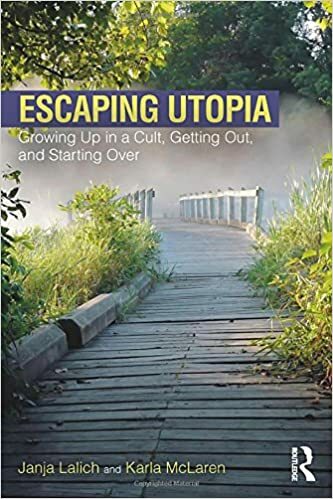 This research is now being written up in a new book entitled Escaping Utopia: Growing Up in a Cult, Getting Out, and Starting Over, to be published in 2017 by Routledge. Lalich and award-winning author (and fellow cult survivor) Karla McLaren, M.Ed. craft Lalich’s original and groundbreaking research into an accessible and engaging book, the first of its kind focusing on this particular population. Lalich and McLaren explore fundamental questions about human nature, human development, group dynamics, abuse and control, and the triumphs of the human spirit in the face of intense and extended suffering. How To Tell A Cult From A Religion? The material on this website is intended to provide an overview of the issues surrounding controversial groups, cults, extremism, and abusive relationships and experiences, and is presented for educational purposes only. Because each and every case is different, the material related to recovery from such experiences is not offered as a uniform method for recovery, nor is it always successful. Because this is a controversial field, there is a wide array of opinions; thus, the views expressed on this Web site are not necessarily shared, endorsed, or recommended by the owner of this website. Therefore, the owner cannot be held responsible for any error, omission, or outdated material.